A small acrylic double door box is shown to be empty. A small mesh bag is shown to contain a half dollar coin. 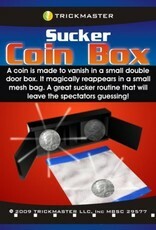 The coin is removed from the bag and placed into one side of the empty double door box. The doors are closed and the box is tilted to the right! A 'Clink' is heard and everyone sees the coin is sliding to the other side. Open the door, and the coin has vanished! This is repeated until the spectators start to catch on and realize the coin is merely rolling back and forth. But wait - both doors are opened showing the coin indeed has vanished completely! 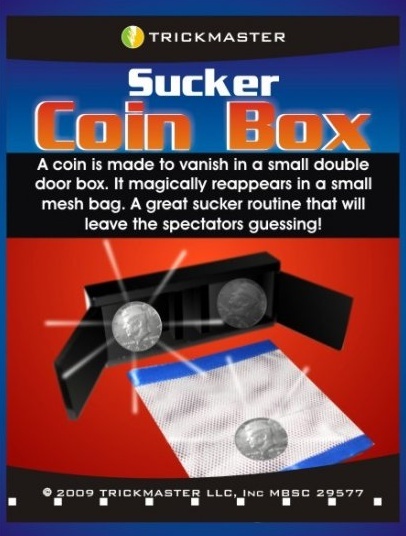 The coin is found to have reappeared back in the bag. Drop the coin from the bag and hand it to the spectator as a souvenir - it has vanished once again!